distribution Scattered over much of the Coastal Plain, and of very spotty distribution over most of the Piedmont and low mountains (2017 record). Apparently absent over most of the mountains, at least over roughly 2,000 feet elevation. Perhaps occurs in most Piedmont counties, but barely ten counties are known as of 2018. Also seemingly absent from the northeastern and far eastern portions of the Coastal Plain. abundance Rare to locally uncommon in the southern portions of the Coastal Plain, and apparently rare northward in that province to the Roanoke River area. Very rare to locally rare over most of the Piedmont, with a remarkable flurry of records from the western and central Piedmont in 2018. Casual in the mountains, where first recorded in 2017.
flight Mid-April to at least mid-July in the Coastal Plain, and from early June into mid-July in the Piedmont and mountains. There is a sight report from the Piedmont for mid-August, though the latest specimen or photo record is only to mid-July. habitat Slow-moving rivers or streams with sandy or silty bottoms. Though the common name suggests it is not normally found along brownwater rivers, such is not the case in NC. Of course, all Piedmont and mountain records are from brownwater areas, and a few in the Coastal Plain are as well, such as along the Cape Fear River. A recent record from Lake Waccamaw (at the spillway/dam) presumably relates to an individual using the headwaters of the Waccamaw River as breeding habitat. behavior Males perch on leaves or branches close to the water, or over the water. comments This is one of the larger clubtails, and the wide club also adds to its striking appearance. However, it can be confused with the Cobra Clubtail. Mark Shields provided the first notable count of the species, seeing and photographing about 30 individuals as he was canoeing down the Black River along the Bladen - Pender county line on 27 May 2016. Recent review by our website editors have determined that one or two photos previously identified as Blackwater Clubtails are actually Cobra Clubtails. And, that puts into jeopardy any sight reports of this species, due to the great confusion of these two species; the Mecklenburg County and the Martin/Bertie (i.e., Roanoke River) reports should be considered as tenuous, and certainly not definitive. 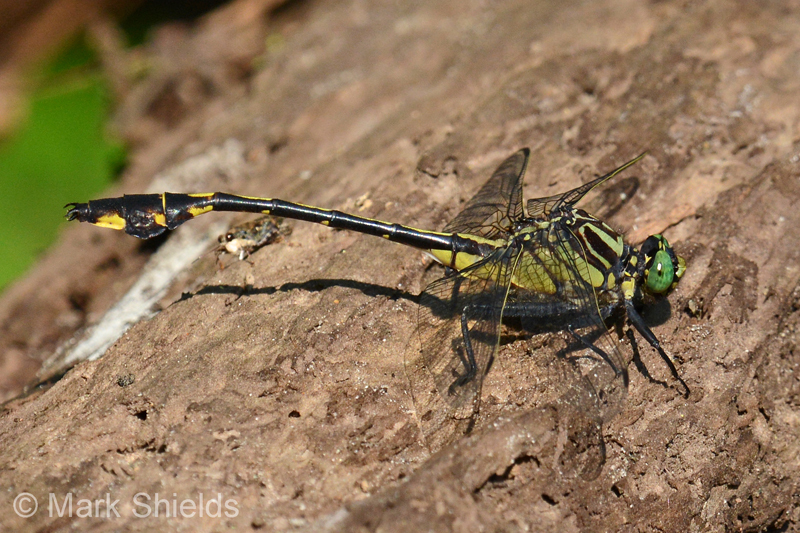 However, Vin Stanton made a remarkable discovery in July 2017, by photographing a female Blackwater Clubtail in Buncombe County near the French Broad River. And, a number of biologists have found the species in 2018 in the central and western Piedmont, documenting the records with photos. The OdonataCentral database has a single record for eastern TN in the Ridge and Valley province, but otherwise the Buncombe record fills in a large gap in the range in the southern Appalachians (between eastern TN and west-central NC). Considering the great number of recent records of the species from the Coastal Plain and Piedmont, the NC Natural Heritage Program may want to move the species off its Watch List. Comment: Richmond; C, 2018-07-06, Pee Dee River; 2 km stretch upstream from Diggs Tract Access, by kayak - male. First record for county. Comment: Wake, 2018-06-10, Neuse River below Falls Lake Dam. - photo on a rock just below thedam. Comment: Duplin, 2017-05-27, Northeast Cape Fear River between Chinquapin Boat Access and Wayne\'s Landing Boat Access, by kayak. First record for county.